Alberta Premier Rachel Notley speaks to cabinet members in Edmonton, Alta., on Monday Dec. 3, 2018. 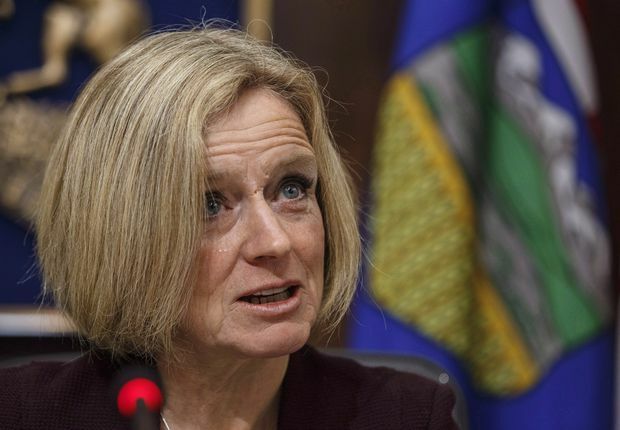 Ms. Notley’s communications director, Cheryl Oates, made it clear the Alberta government wants any unspent money the province pledged returned. The Alberta government is asking for a “partial refund” from Calgary’s failed bid for the 2026 Olympics, though the bid corporation, which is still figuring out how much money is left, wants to keep it to spend on potential venue improvements. The province, the federal government and the City of Calgary pledged a combined $30-million to the bid process, which would have culminated in a decision from the International Olympic Committee in June. But a Nov. 13 plebiscite required by the province ended with 56 per cent voting against the city pursuing a second Olympics in 38 years. The Alberta government had already given the bid corporation and the City of Calgary a combined total of $7-million. Premier Rachel Notley’s communications director, Cheryl Oates, made it clear the province wants any unspent money returned. “We expect that we will receive a partial refund after the corporation is wrapped up, as the full $30-million was not spent," Ms. Oates said in an e-mail. The province had approved $10-million for Calgary’s bid. A payment of $5-million was made to the city in the spring of 2018. A $2-million payment was made directly to Calgary 2026 after the bid corporation was formed in June. The final $3-million was contingent on Calgary presenting its bid book to the IOC in January, 2019. The province also covered the $2-million cost of the plebiscite. Calgary 2026 is now preparing its financial statement and executive director Mary Moran had hoped some of the unspent bid funding “might be left for infrastructure legacy." “We are looking at the refurbishing of those venues [from the 1988 Olympics] and what that cost associated would be just to keep the life cycle going,” she said. “We will submit a report at some point to all orders of government. That might be the beginning of a discussion on what they might be willing to commit in the future." Calgary Mayor Naheed Nenshi has asked for even more, arguing that the federal government should still provide some of the $1.45-billion the federal government was ready to give for hosting the Games to upgrade Calgary’s existing Olympic venues. Mr. Nenshi used a meeting with Prime Minister Justin Trudeau in November to make the pitch, but little of consequence was said after the meeting. While operating with a skeleton staff at its downtown office, Calgary 2026 has held debriefing sessions to chronicle what worked and what didn’t, information that could be passed along for future bids either by Calgary or another Canadian city. Calgary 2026 is looking to complete its wrap-up by the end of June.